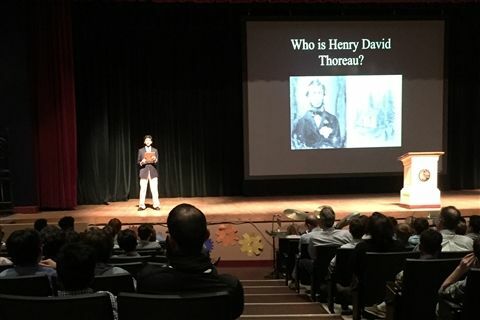 Krish Malte '21 shared original poems inspired by his study of Henry David Thoreau. Krish’s words were wonderfully calming and pleasant to the ear, alluding to the beauty of simplicity, solitude and nature. Thank you, Krish, for sharing a part of yourself with us. We are proud to call you a Junior Research Fellow. The Junior Research Fellowship program gives students in grades 6-8 the opportunity to pursue high-level research on a chosen topic.